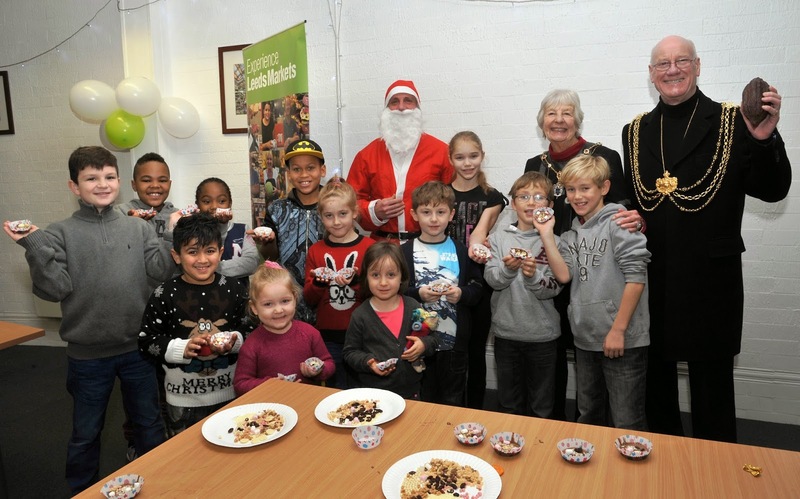 Top picture caption: (Back-L-R-) Father Christmas, Leeds Children’s Mayor, Amy Eckworth-Jones, Lady Mayoress of Leeds, Janet Harper JP and the Lord Mayor of Leeds, Cllr David Congreve with youngsters who enjoyed the Santa Chocolate Workshops. Bottom caption: (L-R-) The Lady Mayoress of Leeds, Janet Harper JP, Leeds Children’s Mayor, Amy Eckworth-Jones, the Lord Mayor of Leeds, Cllr David Congreve, Leeds Children’s Hospital mascot, Mr Ted and Father Christmas join in the fun with Aiden Eckworth-Jones and Rowen Eckworth-Jones. The Lord Mayor of Leeds Cllr David Congreve was a special guest at a magical chocolate-themed event held at a historic market this month. Sponsored by the Lord Mayor’s Charity Appeal, which this year is raising funds for the Leeds Children’s Hospital, youngsters were given the opportunity at Leeds Kirkgate Market to take part in a fun-filled chocolate extravaganza, which was hosted by the man himself Father Christmas! 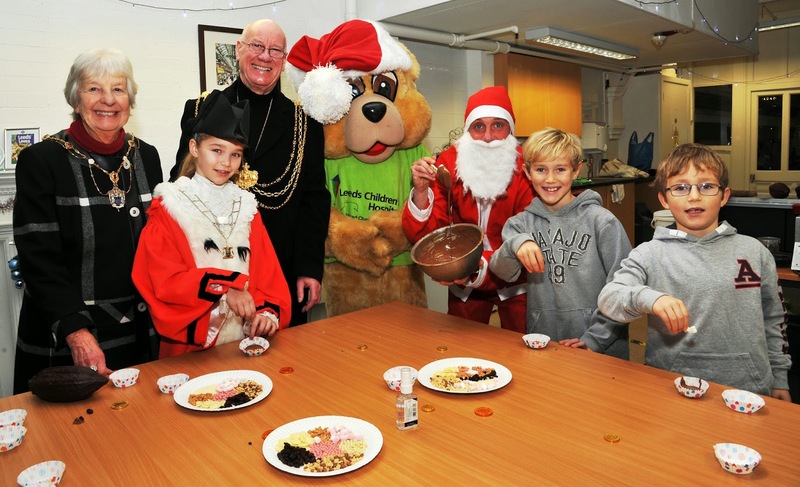 Joining the Lord Mayor at one of the Santa Chocolate Workshops was the Lady Mayoress Janet Harper JP, and the Leeds Children’s Mayor, Amy Eckworth-Jones. "The Santa Chocolate Workshops at Leeds Kirkgate Market really were great fun, and I was delighted that my charity appeal, which this year is Leeds Children’s Hospital, had the opportunity to sponsor this event. "The youngsters really did seem to enjoy it, and with Father Christmas also present, I am sure this is a day they will not forget in a hurry!"